"I like to have friends and family over for a special Sunday brunch, especially when there's a 'big game' on television. These colorful eggs go perfectly with sausage, toasted English muffins and fresh fruit." In a small bowl, beat eggs. Add green pepper, milk, onions, salt and pepper. Pour into a lightly greased skillet. Cook and stir over medium heat until eggs are nearly set. Add the tomato; cook and stir until heated through. I used red bell pepper, because that was what I had, and 2% milk. I used one full egg and two egg whites and added fresh garlic. I garnished it with a little organic salsa and Frank's Hot Sauce. Used water instead of milk and deleted the tomatoes because I didn't have any. Came together very quickly. Topped with shredded cheddar cheese. Delicious exactly as written and VERY easy! Makes a colorful, inviting dish. 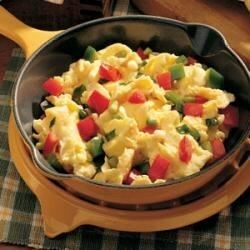 Great scrambled eggs. I wish I would have cut the tomato smaller.